The shuttle cars and scoops used in underground coal mines are not typically equipped with operators cabins, at least nothing that compares to equipment on the surface — let alone air conditioners. Specific conditions, however, at some longwall mines are making this modifica- tion more popular. Jim Winkler, owner of American Hydraulics and Rebuild of West Logan, West Virginia, and vice president of the Logan (West Virginia) Coal Vendors Association, has seen a spike in his sales of the Kenway Series 9043 self-contained hydraulic air conditioner recently, espe- cially to coal mine operators in Illinois. "Some mines are adding aftermarket enclosed cabs to shuttle cars," he said. "These are to protect the shuttle car oper- ators from the dust they would otherwise be exposed to during the drive between the continuous miner and the feeder- breaker. And of course, once you enclose the operator in a cab, you have to deal with a jump in temperature, plus the win- dows can fog up. Underground tempera- tures are worse in the Illinois mines I'm dealing with than the mines I'm familiar with in the Appalachian area. I'm told that in some of the Illinois mines, ambient temperatures are in the 70s or even 80s, so you can't really enclose the cab with- out providing air-conditioning." Air conditioning does more for the cab environment than cool the air. It also con- trols humidity and particulate matter. "A regular part of maintaining the AC unit is changing the air filters," Winkler said, referring to the improvement in air quali- ty as well as comfort in the cab. A water spray controls dust at the cut- ter heads at the front of the continuous miner and at the feeder, yet shuttle car operators are still exposed to dust kicked up by the shuttle car itself. Conditioned air in an enclosed cab is the answer, according to some mine operators. Winkler's company provides valving and hydraulic components as well as the Kenway hydraulic air-conditioning units used by the shops that actually modify the shuttle cars for the mines. "There's not a lot to the installation," he said. "Once the cab is enclosed, you just need six bolts to attach the unit, you run your hydraulic fluid lines to the car's existing hydraulic system, and you're pretty much ready to go." Ken Detloff, owner and president of Kenway Engineering of Fairmont, Minnesota, they are building versions of the Series 9043 hydraulic AC units that are customized to fit particular models of shuttle cars. "We're talking about cramped conditions, where the AC unit has to be out of the way both for comfort and to preserve the operator's visibility. You can't just make a generic unit and bolt it on anywhere," Detloff said. Detloff added that his hydraulics-driv- en Kenway Series 9043 features a spark- less motor. 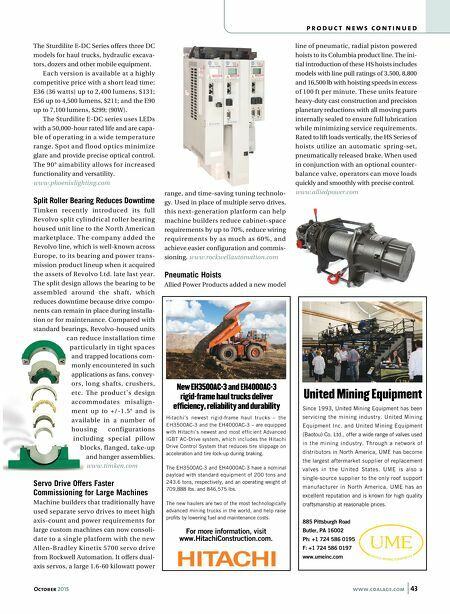 "We provide hydraulic heating and AC units to a lot of industries that operate in explosive environments requir- ing a no-spark motor," he said. "That's another significant advantage to this kind of air conditioner." 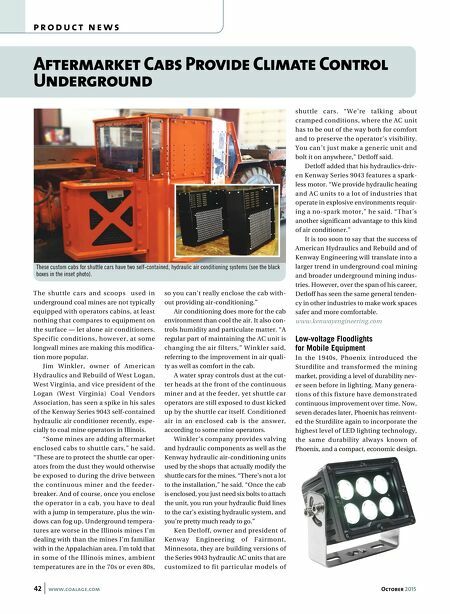 It is too soon to say that the success of American Hydraulics and Rebuild and of Kenway Engineering will translate into a larger trend in underground coal mining and broader underground mining indus- tries. However, over the span of his career, Detloff has seen the same general tenden- cy in other industries to make work spaces safer and more comfortable. www.kenwayengineering.com Low-voltage Floodlights for Mobile Equipment In the 1940s, Phoenix introduced the Sturdilite and transformed the mining market, providing a level of durability nev- er seen before in lighting. Many genera- tions of this fixture have demonstrated continuous improvement over time. Now, seven decades later, Phoenix has reinvent- ed the Sturdilite again to incorporate the highest level of LED lighting technology, the same durability always known of Phoenix, and a compact, economic design. 42 www.coalage.com October 2015 p r o d u c t n e w s Aftermarket Cabs Provide Climate Control Underground These custom cabs for shuttle cars have two self-contained, hydraulic air conditioning systems (see the black boxes in the inset photo).